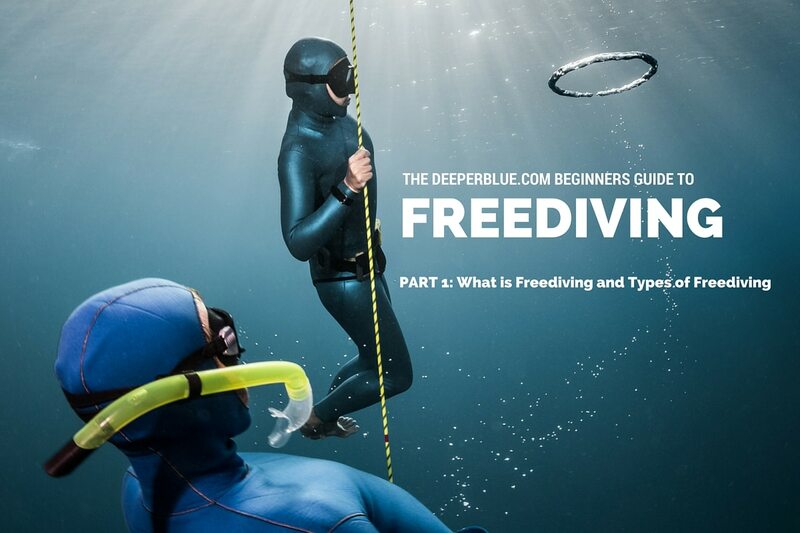 This is the DeeperBlue.com Beginners Guide to Freediving. We’ve put this guide together to help budding Freedivers understand what is required to get started. Part 1 of this series takes a look at What is Freediving and the Types of Freediving. Freediving is breath hold diving, being in and under the water whilst holding ones breath. Today, most people associate freediving with images of super humans plunging to the darkest depths of the ocean with only the air in their lungs, the power of their bodies and the will of their minds to keep them alive and bring them back. However every time you slip into water and hold your breath you are a freediver, exploring our world of water from the shallows to, occasionally the depths. Read on for our guide to What is Freediving and Types of Freediving. Diving without an aqualung is often referred to as ‘skin diving’ or ‘snorkeling’. Both can use mask, snorkel and fins, but freediving will always involve a breath hold, no matter how deep you go. Humans first started freediving through necessity, for food, trade-able items or items lost overboard, however in more recent time, freediving has evolved into a recreational pastime, a way to take photos, catch food, and as a sport. Competitive freediving has different disciplines to reflect the various ways that you can be in the water and hold your breath. This came with the emergence of competitions involving teams, countries and many individuals. Back in the early part of this century there was a distinction between records done in salt and fresh water, although this has since been stopped. In individual and team world championships, each diver will perform a constant weight dive with fins, a dynamic swim with fins and a static breath hold with points awarded for each discipline to arrive at a final combined score. Free immersion, constant weight no-fins and dynamic no-fins can also be a competition discipline they are usually stand alone events. The most recognized disciplines are explained below, although many people often seek to invent new disciplines, whether for fun or competition. Let’s take a look at the different types of freediving now. You’ll hear Freedivers talk in strange code when referring to diving to depth or in the pool with different equipment and here we’ll try to de-mystify it. This is a depth discipline and a competition discipline. 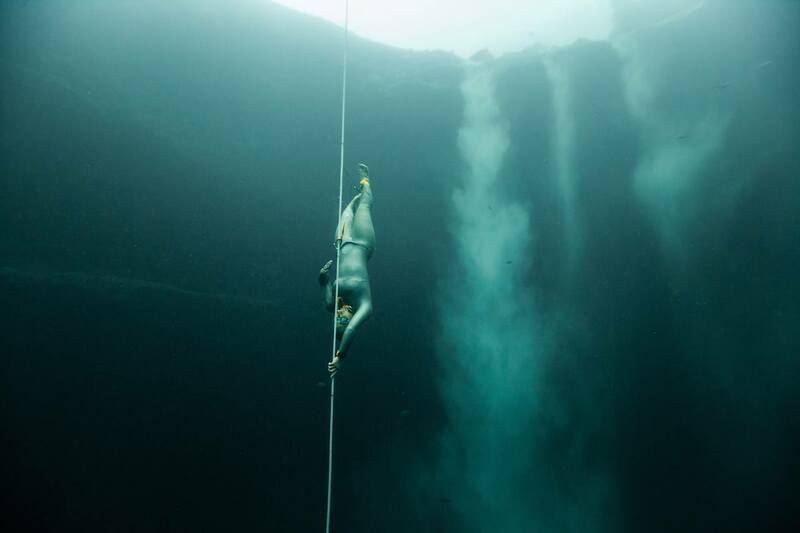 Seen by many as the purest form of freediving, the diver descends and ascends under their own power, the weight (or not) that they wear on their person remaining the same throughout the dive. Constant weight with fins (CWT), along with static apnea, were the original two competition disciplines before Dynamic with Fins (DYN) was added. In the first international competitions, most people wore bi-fins with only a handful of people using the monofin. The monofin proved to be far more effective than bi-fins and now it is the monofin that all deep competitors use. In the past few years, constant weight without fins (CNF) has become increasingly popular. There are competitions which have CNF as a category, with depths thought impossible even for No-Limits diving a few decades ago. CNF can be challenging overcoming initial positive buoyancy at the start of the dive and then negative buoyancy at the bottom as the diver starts to ascend. This is further complicated by having to use one of the pulling arms to equalize. To help overcome the issue of equalization, most CNF divers wear a nose-clip and fluid goggles (or no mask) to keep both arms free for the stroke. A depth discipline where no fins are worn, and the diver pulls down a rope and back. This is often used as a warm up for a constant weight dive to save the legs whilst still preparing the body for depth and checking how smoothly the ears are equalizing. It is also used extensively on beginner freediver courses so students can learn equalization skills slowly and carefully. For many people new to the sport and having issues equalizing, it is only possible to do so feet first, and so pulling down the rope is invaluable, although this takes extra effort. Whenever a diver uses free immersion to prepare for depth diving, fins are always used as a safety precaution to make it easier to ascend to the surface. This discipline uses added weight to take the diver to depth, and then the diver returns to the surface under their own steam, finning and also using the arms to pull on the rope. It is not a competition discipline however there are national and world records set in it and it is often used to train equalization and constant weight with fins diving. This discipline is the deepest, the one that most makes the news, and arguably the most dangerous. In No Limits, you use a weight to take you as deep as possible and then a buoyancy device to return you to the surface. 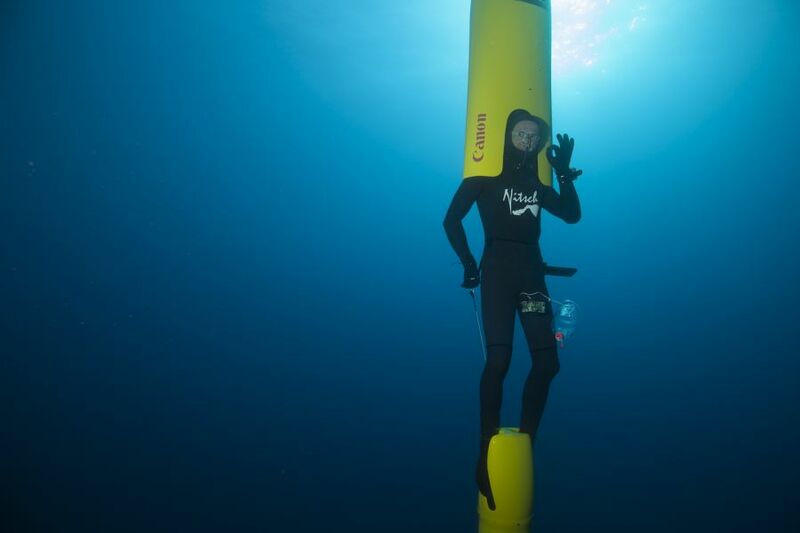 Very few freedivers train for No Limits however it was the main method of freediving that the pioneers such as Jacques Mayol and Enzo Majorca used when diving deeper, and was immortalized in the film The Big Blue. In the sixties, the depths achieved meant that it was possible for the diver at the bottom of the dive to use a tank to fill a lift bag that would take them back to the surface. As dives got deeper and deeper however, the lift achieved was not as effective and sometimes the hose would come out of the bag it was supposed to be filling. In addition, with the risk of nitrogen narcosis, it was unsafe to reply on the diver at the bottom of the dive to execute a series of functions to fill the bag, As a result, the deepest divers have preferred to use a buoyancy device not reliant on air or the diver at the bottom to perform and bring the diver safely back to the surface. This is simply holding your breath for as long as possible, lying on the surface of the water, usually in a swimming pool. It is one of the hardest disciplines, simply due to the fact that there is nothing to distract you from the breath hold. It is also very easy to give up as the surface is millimeters rather than meters away. Static apnea (STA), along with constant weight with fins is one of the original competition disciplines and is always the last to be performed in competitions. It is the ‘decider’ discipline, with competitors using tactics to ensure they only have to do the minimum needed in order to win, unless of course they are going for a record! 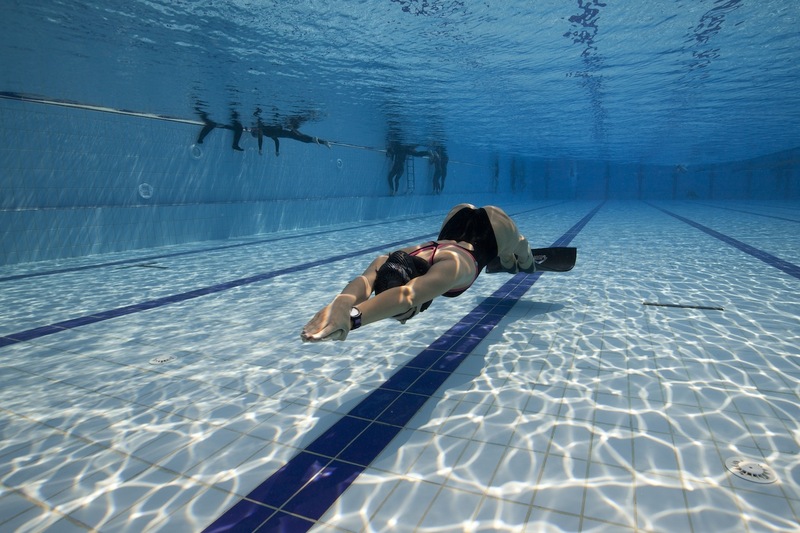 Static apnea is a discipline that can be practiced all year round in a pool, which is perfect for freedivers who live far from open water or in colder climates where it is not possible to train depth all year round. In addition, it is great training for all round apnea ability, mental toughness and confidence. This discipline is usually performed in a pool and is based on maximum distance horizontally under the water. Both are competition disciplines but dynamic with fins is used in International team competitions. Dynamic disciplines are great training for style and constant weight diving particularly in colder countries where access to open water diving is limited to the summer months. Some divers are also unable to equalize or find it very difficult, and so dynamic with and without fins is a way that they can enjoy freediving without the issues of depth. Even though records can be set in every discipline, when freediving for fun, the most common discipline freedivers use is constant weight, using fins to explore and enjoy the underwater world. Free immersion is often used for equalization practice and to get to a suitable depth for buddying whilst saving the legs for a possible rescue and many freedivers take to one discipline such as dynamic without fins over another simply because they enjoy the feeling and have little access to depth due to location or weather. 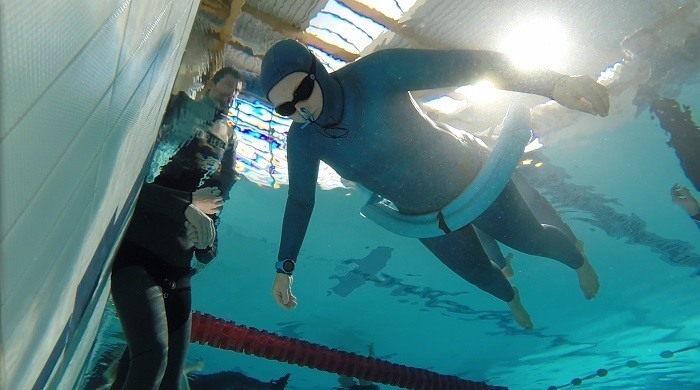 If however a freediver is keen on competing then they will usually focus on the main competition disciplines of constant weight with fins, dynamic with fins and static apnea. Ultimately however, freediving is about being in the water whilst breath holding and practicing one discipline can have beneficial results for another.